Imagine you’re handling the biggest negotiation of your life – say, peace in the Middle East. You need to leave emotions out of it, right? 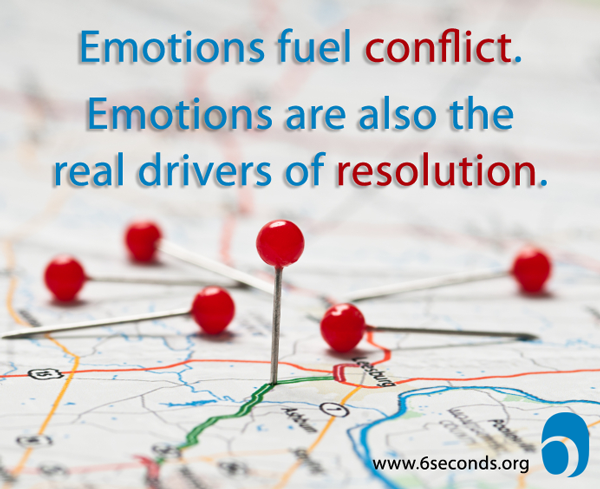 It’s no surprise that emotions can fuel a conflict. What few people realize is that these same dynamics are also a key part of the solution. Shapiro explained how it works in a keynote at Six Seconds’ NexusEQ Conference at Harvard Medical School Conference Center in June 2013. What is required to solve the world’s most pressing problems? “It’s easy to image a dynamic at play between Israelis and Palestinians. These parties have a host of differences, and the dominant stance for dealing with those differences tends to be adversarial. They each focus on protecting their side’s interests, which implies winning OVER the other.” But Shapiro explains that it’s nearly impossible to find meaningful resolution from this position. Moving out of that adversarial stance is central to Dr. Shapiro’s work. In his book, Beyond Reason: Using Emotions as You Negotiate (with Roger Fisher), he makes the case that logic is not enough to achieve resolution. Feelings drive people toward conflict – and toward resolution. At this stage, feelings such as anger, fear, and hurt push people to narrow their focus to zero in on what’s not working instead of building long-term, cooperative relationships. A small change unlocks the situation. Instead of “facing off,” Shapiro says we need to get on the same side of the issue: “Shift the relational stance so it’s no longer ‘me versus you’ but the two of us working side by side facing a shared problem. This creates a substantial emotional shift.” Now the “colorful set of stubborn emotions” changes to expansive feelings such as curiosity, commitment, and even compassion. There are many powerful skills that Shapiro and colleagues teach at Harvard Law School and in negotiation programs around the world to handle these substantive issues. But to see “underneath” the presenting problem and work with the context, another set of skills is required: The skills of Emotional Intelligence. Intelligence is the ability to collect data and use it to solve problems. Mathematical intelligence allows us to accurately count, and to use that data to calculate numerical solutions. Emotional intelligence allows us to accurately perceive people, and to use that data to calculate relational solutions. Daniel L. Shapiro, Ph.D., is Founder and Director of the Harvard International Negotiation Program. He also is Assistant Professor in Psychology at Harvard Medical School/McLean Hospital and affiliated faculty at Harvard Law School’s Program on Negotiation, where he serves as Associate Director of the Harvard Negotiation Project. An excellent and powerful piece of work, carrying a message of Hope, Possibility, and Optimism: Harvard and the NexusEQ are doing a great job to make life easier for the humanity. The article makes a strong case for Emotional Intelligence; Thanks Josh, and best wishes for June 2013! Thank you Taquir – I agree, to me this is one of the most powerful reasons we need to teach the skills of emotional intelligence. Peace starts inside. I agree wholeheartedly with Tauqir and am really excited by how quickly the understanding for the need of Emotional Intelligence is growing. Really great work and thanks. Excellent. Thinking outside of solely getting your needs met, actively listening, wanting to create value to claim it and have the other party want more to help you get it. Excellent article! Thank you so much for posting it here. As an Emotion Code practitioner, I can testify that emotions are an undeniable reality in our life: they are energy in motion, constantly flowing through our field like the blood flowing through our veins. This cannot be ignored or put aside, as you so rightly stated. In my energy healing work, I assist people in identifying and releasing negative trapped emotions and this is bringing a wonderful positive change in their lives. I strongly believe in “let there be peace on earth and let it begin with me”. We cannot change anyone else but we can work on ourselves to clear our what is holding us down, causing pain, resentment and misery and stealing our joy. If each person does that, there will be a shift, a transformation on a global level. Thank you, Dr. Shapiro for thinking of the youth. Giving the youth the tools for better communication, perspective and understanding is a wonderful way to assure they have the much needed skills so they will not repeat the mistakes that brought so much suffering to their forefathers and make the world a safer place be to and thrive. Isn’t that what we all want for ourselves and our children and their children? Outstanding article. It is always about the emotions, no matter how much people insist that emotions should not play a role in logical decision making. Business fails in this area. The courts fail miserably trying to stifle emotion. What I liked reading was that emotions drive both conflict (we knew that) and resolution (maybe not all of us thought of it like this). 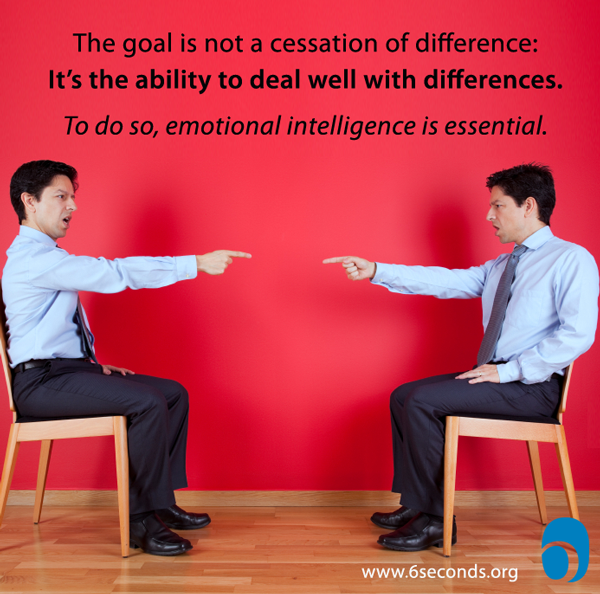 Emotional Intelligence is undoubtedly the critical missing piece in conflict management or resolution. Until it becomes taught at home, in schools, at the workplace, with it being an expected part of those cultures and until constant refresher “courses” are taught, we will suffer the consequences of not using it. Hi Michael – I like that paradox (?) too — it’s easy, esp in the midst of conflict, to see some emotion as “bad”… but it’s a huge shift to consider: What if this messy emotional “stuff” is also going to fuel the solution? Well said about the “messy emotional stuff” also being what can drive the solution if we have the courage to engage in it, learn about it and find the underlying interests, which we might very well be able to effectively address. Not pretty work and it does’ take emotional intelligence as a tool, but what possible rewards. This is a great piece, and very exciting for me to read. I have had the pleasure of attending workshops with Dan Shapiro. I am currently working with Linda Kohanov, who has developed an elegant body of EQ work. This work includes some very learnable tools to develop emotional agility, an increased tolerance for vulnerability, a four step method to quickly and effectively process emotions, inspire and maintain positive emotions, increase awareness of non-verbal communication (the other 90%), and a host of other practical ways to apply work with emotions. Her new book, “The Power of the Herd; A Non-Predatory Approach to Social Intelligence, Leadership, and Innovation” explains much of this body of work. ( http://www.amazon.com/The-Power-Herd-Nonpredatory-Intelligence/dp/1577316762/ref=sr_1_1?ie=UTF8&qid=1373247405&sr=8-1&keywords=power+of+the+herd) Many of the tools were developed based on equine herd dynamics and behavior. We have found that practicing emotional intelligence skills with horses is a very effective way for people to learn to monitor and regulate their own emotions, and the emotions of others. Horses, as prey animals, have highly developed sensitivity to emotions. They mirror back to people their own emotions, and provide immediate feedback which helps people recognize their own emotional states, and learn to get messages behind their emotions and make immediate adjustments. Very interested piece, which inspires me to believe we are evolving toward much more advanced method for resolving conflict and coexisting. I think that a holistic view at conflict can be helpful in better understanding the complexity of confict processes, and effectively engaging in it . 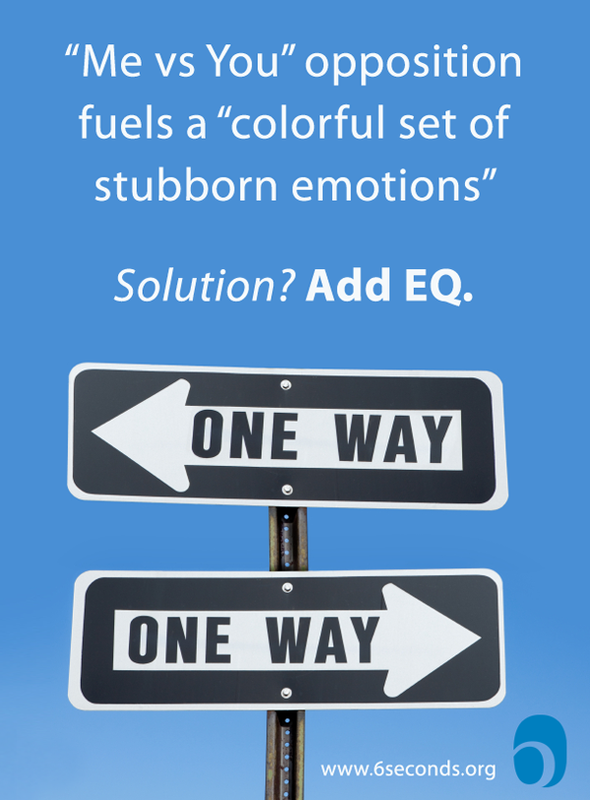 EQ is certainly a central component but is one component of a few central contextual components for a successful conflict engagment. Relational intelligence, the way we relate to the other, and treat the other is key. Learning to treat the other with respect and dignity, as a whole, legitimizing his or her of way of being, thinking and feeling, is crucial in conflictual situations. It is helpful to view the interaction through a relational perspective rather than an individualistic perspective. It broaden our tendency to focus on individual in the western world. Successfully engaging in conflict is not merely about having Self-awareness, Self-regulation or empathy, it is about looking at our social involvement from a different, relational perspective. Hi Tzofnat – that’s beautifully said – we have a choice to SEE through various lens, seeing through a relational lens reveals elements of the story that are invisible when we look only through the individualistic. In some places in the world it seems culturally “normal” to take one or the other view — and so incredibly powerful to be able to change lenses. Great Article and I read it and read it again and read it again, as I was reading one thing coming to my mind how do I move myself and stand with the opponent, this is like a very difficult situation. It is like I give up. I liked the subject and learned lots today in the topic.